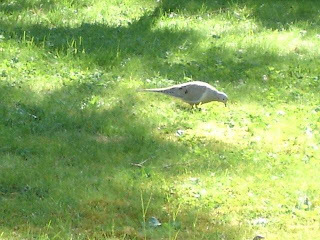 A CHUKAR was seen on Thetis Island. DOWNY WOODPECKER, NORTHERN FLICKER, PILEATED WOODPECKER, OLIVE-SIDED FLYCATCHER, WILLOW FLYCATCHER, PACIFIC-SLOPE FLYCATCHER, CASSIN'S VIREO, WARBLING VIREO, RED-EYED VIREO, NORTHWESTERN CROW, COMMON RAVEN, VIOLET-GREEN SWALLOW, CHESTNUT-BACKED CHICKADEE, BROWN CREEPER, BEWICK'S WREN, WINTER WREN, AMERICAN DIPPER, GOLDEN-CROWNED KINGLET, SWAINSON'S THRUSH, AMERICAN ROBIN, EUROPEAN STARLING, CEDAR WAXWING, ORANGE-CROWNED WARBLER, TOWNSEND'S WARBLER, WESTERN TANAGER, SPOTTED TOWHEE, SONG SPARROW, BLACK-HEADED GROSBEAK, PURPLE FINCH and PINE SISKIN . COMMON NIGHTHAWKS were seen above Jingle Pot Road by the Millstone River and along Nanaimo Lakes Road in Nanaimo. A PILEATED WOODPECKER was pecking on a dead Arbutus tree in the 1100 block of Thunderbird Drive in Nanaimo. BLACK-HEADED GROSBEAKS were seen visiting feeders in the 5000 block of Rheanna Place in Nanaimo. Monday, July 23, 2007@ 7:30 pm. There will be no Sunday Bird Walk on July 01, 2007. We will meet at the east parking lot of The Parksville Civic and Technology Centre at Jensen Avenue and McCarter Street at 9:00 a.m. in Parksville or at the corner of Plummer Road and Shorewood Drive off Highway 19A about 9:10 a.m. The Sunday Bird Walk on July 08, 2007 will be going to McGregor Marsh in Nanaimo. Meet at the Bird Store at 9:00 a.m. or at the top of Rutherford Road across from the Quilted Duck at about 9:15 a.m. The Sunday Bird Walk went to Hemer Provincial Park in Cedar. Twenty birders found the following thirty-seven species: WOOD DUCK, MALLARD, BALD EAGLE, TURKEY VULTURE, GREAT BLUE HERON, RUFOUS HUMMINGBIRD, RED-BREASTED SAPSUCKER, NORTHERN FLICKER, WILLOW FLYCATCHER, PACIFIC-SLOPE FLYCATCHER, COMMON RAVEN, NORTHWESTERN CROW, VIOLET-GREEN SWALLOW, CLIFF SWALLOW, BARN SWALLOW, RING-NECKED PHEASANT, BUSHTIT, CHESTNUT-BACKED CHICKADEE, RED-BREASTED NUTHATCH, BROWN CREEPER, BEWICK'S WREN, WINTER WREN, SWAINSON'S THRUSH, AMERICAN ROBIN, CEDAR WAXWING, ORANGE-CROWNED WARBLER, YELLOW WARBLER, YELLOW-RUMPED WARBLER, COMMON YELLOWTHROAT, WESTERN TANAGER, SPOTTED TOWHEE, SONG SPARROW, BLACK-HEADED GROSBEAK, RED-WINGED BLACKBIRD, PURPLE FINCH, HOUSE FINCH, HOUSE SPARROW. A TURKEY VULTURE was spotted perched in a tree about ten km up Cooper Canyon Road near Chemainus. A YELLOW-RUMPED WARBLER was seen at Longwood Station in Nanaimo. The Wednesday bird walk went to the Top of Corfield Road in Parksville. Among the highlights was the sighting of five species of Warblers--ORANGE-CROWNED WARBLER, BLACK-THROATED GRAY WARBLER, TOWNSEND'S WARBLER, MACGILLIVRAY'S WARBLER and WILSON'S WARBLER. We were treated to the singing of a HOUSE WREN. Ten birders found the following thirty-five species: CALIFORNIA QUAIL, TURKEY VULTURE, BALD EAGLE, COOPER'S HAWK, BAND-TAILED PIGEON, RUFOUS HUMMINGBIRD, RED-BREASTED SAPSUCKER, NORTHERN FLICKER, PILEATED WOODPECKER, WILLOW FLYCATCHER, PACIFIC-SLOPE FLYCATCHER, NORTHWESTERN CROW, COMMON RAVEN, VIOLET-GREEN SWALLOW, CHESTNUT-BACKED CHICKADEE, RED-BREASTED NUTHATCH, BEWICK'S WREN, HOUSE WREN, WINTER WREN, SWAINSON'S THRUSH, AMERICAN ROBIN, EUROPEAN STARLING, CEDAR WAXWING, ORANGE-CROWNED WARBLER, BLACK-THROATED GRAY WARBLER, TOWNSEND'S WARBLER, MACGILLIVRAY'S WARBLER, WILSON'S WARBLER, SPOTTED TOWHEE, SONG SPARROW, WHITE-CROWNED SPARROW, BLACK-HEADED GROSBEAK,NRED-WINGED BLACKBIRD, PURPLE FINCH and AMERICAN GOLDFINCH. An OSPREY was seen fishing at Buttertubs Marsh in Nanaimo. An EVENING GROSBEAK was seen along Big Whale Lookout off Lost Lake Road in Nanaimo. Five CEDAR WAXWINGS were seen along Reef Road in Beachcomer. GOLDEN-CROWNED KINGLETS, juvenile CHIPPING SPARROWS, juvenile SPOTTED TOWHEES and a juvenile PILEATED WOODPECKER are visiting a yard along Venture Drive in Nanaimo. Monday, June 25, 2007@ 7:30 pm. We will meet at the east parking lot of The Parksville Civic and Technology Centre at Jensen Avenue and McCarter Street at 9:00 a.m. in Parksville or at the end of Kinkade Road (away from the ocean),off Highway 19A about 9:20a.m. SOOTY GROUSE, CALIFORNIA QUAIL, RUFOUS HUMMINGBIRD, NORTHERN FLICKER, PILEATED WOODPECKER, PACIFIC-SLOPE FLYCATCHER, OLIVED-SIDED FLYCATCHER, WARBLING VIREO, VIOLET-GREEN SWALLOW, TREE SWALLOW, CHESTNUT-BACKED CHICKADEE, RED-BREASTED NUTHATCH, BEWICK'S WREN, WINTER WREN, SWAINSON'S THRUSH, AMERICAN ROBIN, CEDAR WAXWING, ORANGE-CROWNED WARBLER, BLACK-THROATED GRAY WARBLER, TOWNSEND'S WARBLER, COMMON YELLOWTHROAT, WILSON'S WARBLER, MACGILLIVRAY'S WARBLER, WESTERN TANAGER, SPOTTED TOWHEE, SONG SPARROW, GOLDEN-CROWNED SPARROW, WHITE-CROWNED SPARROW, DARK-EYED JUNCO, RED-WINGED BLACKBIRD, HOUSE FINCH, PURPLE FINCH and PINE SISKIN. A WESTERN TANAGER was seen in Ladysmith on the Timberwest Property. PURPLE FINCH, RED-BREASTED NUTHATCH and BLACK-HEADED GROSBEAK were seen in the 200 block of Dawkins Lane in Nanaimo. Two MOURNING DOVES were seen in the 1800 block of Morello Road in Nanoose Bay and in the100 block of Meridian Way in Parksville. A BLACK-HEADED GROSBEAK was seen at the Boat Harbour in Cedar. A BARN OWL was being mobbed by BARN SWALLOWS in the Yellow Point area in the 13000 block of Doole Road Ladysmith. large flock of BLACK SWIFTS with a few VAUX'S SWIFTS dispersed among them and about ten WILLOW FLYCATCHERS. Thirteen birders found the following thirty-six species: CANADA GOOSE, MALLARD, COMMON MERGANSER, CALIFORNIAQUAIL, GREAT BLUE HERON, BALD EAGLE, SHARP-SHINNED HAWK, SPOTTED SANDPIPER, GLAUCOUS-WINGED GULL, BAND-TAILED PIGEON, BLACK SWIFT, VAUX'S SWIFT, RUFOUS HUMMINGBIRD, BELTED KINGFISHER, DOWNY WOODPECKER, NORTHERN FLICKER, WILLOW FLYCATCHER, PACIFIC-SLOPE-FLYCATCHER, WARBLING VIREO, NORTHWESTERN CROW, COMMON RAVEN,VIOLET-GREEN SWALLOW, CHESTNUT-BACKED CHICKADEE, BEWICK'S WREN, WINTER WREN, SWAINSON'S THRUSH, AMERICAN ROBIN, EUROPEAN STARLING, ORANGE-CROWNED WARBLER, BLACK-THROATED GRAY WARBLER, SPOTTED TOWHEE,SONG SPARROW, WHITE-CROWNED SPARROW, RED-WINGED BLACKBIRD, HOUSE FINCH, and AMERICAN GOLDFINCH. A PILEATED WOODPECKER was seen on a balcony of a condominum along Prideaux Street. An AMERICAN KESTRAL was seen on a hydro line at the Ugly Dwarf Meadows near the ESSO gas station in Nanoose Bay. We will meet at the east parking lot of The Parksville Civic and Technology Centre at Jensen Avenue and McCarter Street at 9:00 a.m. in Parksville or at the end of Corfield Road (away from the ocean) at about 9:10 a.m. The Sunday Bird Walk on June 24, 2007 will be going to Hemer Provincial Park in Cedar. Met at the Bird Store at 9:00 a.m. or at the parking area at Hemer Park off Cedar Road. at about 9:30 a.m.
Well it looks like they aired the segment on Bird Watching on Tuesday and not Thursday, but they may air it on the weekend as they re-run shows from the week. Let us know if you see it. 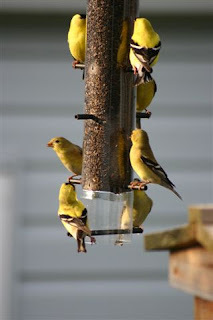 - bird feeder, a west coast cedar bird feeder for attracting all the birds in dads backyard, or how about a nyjer bird feeder to attract the beautiful bright yellow American Goldfinch. A new hummingbird feeder that does not leak or attract bees and ants might be good for dad. - a hammock to help dad relax. - binoculars, a new lightweight and clear set, instead of that heavy old set. - how about something for his garden, like a birdbath. - something practical, such as a big bag of his favorite birdseed. - if you are undecided there is always a gift certificate so he can choose the right gift. Many other great gift ideas for dad and we are open Sundays noon to 4:30. Last Thursday we did a segment about Bird Watching in Nanaimo with Melissa from The Daily on Shaw T.V. at Buttertubs Marsh. There was a small group of birders who were out for the walk and are now t.v stars. The segment is to air this Thursday June 14 on The Daily, which runs hourly after 6:00 pm. If you get a chance to see it please let us know how we did. Good birding. An AMERICAN KESTRAL was seen on the Hydro lines over looking the Ugly Dwarf Meadows in Nanoose Bay. A MERLIN was seen above Highway 19 at Nanoose Bay. BALD EAGLE, TURKEY VULTURE, CANADA GOOSE, GREAT BLUE HERON, BLACK OYSTERCATCHER, DOUBLE-CRESTED CORMORANT, PELAGIC CORMORANT, SURF SCOTER, BLACK SCOTER, WHITE-WINGED SCOTER, THAYER'S GULL, GLAUCOUS-WINGED GULL, PIGEON GUILLEMOT,RUFOUS HUMMINGBIRD, BELTED KINGFISHER, NORTHERN FLICKER, VIOLET-GREEN SWALLOW, PACIFIC-SLOPE FLYCATCHER, YELLOW WARBLER, ORANGE-CROWNED WARBLER, NORTHWESTERN CROW, COMMON RAVEN, CHESTNUT-BACKED CHICKADEE, SWAINSON'S THRUSH, AMERICAN ROBIN, EUROPEAN STARLING, SPOTTED TOWHEE, SONG SPARROW, RED-WINGED BLACKBIRD, PURPLE FINCH, HOUSE FINCH and AMERICAN GOLDFINCH. AMERICAN GOLDFINCH, HOUSE FINCH, RUFOUS HUMMINGBIRDS and a family of SPOTTED TOWHEES were seen in a yard in the 200 block of Dawkins Lane in Nanaimo. BROWN-HEADED COWBIRD and PURPLE FINCH. A BLACK-HEADED GROSBEAK was seen visiting feeders along Fairview Crescent in Nanaimo. An AMERICAN KESTRAL was seen hovering over the Ugly Dwarf Meadows in Nanoose Bay. Three BROWN-HEADED COWBIRDS were visiting feeders along Homestead Way in Ladysmith. The Wednesday Bird Walk on June 13, 2007 will be going to the Englishman River Estuary, Shelly Road side. We will meet at the east parking lot of The Parksville Civic and Technology Centre at Jensen Avenue and McCarter Street at 9:00 a.m. in Parksville or at the end of Shelly Road off Highway 19A at about 9:10 a.m. The Sunday Bird Walk on June 17, 2007 will be going to Linley Valley. Meet at the Bird Store at 9:00 a.m. or at the parking area at the end of Burma Road, off Lost Lake Road, at about 9:15 a.m.
An AMERICAN KESTRAL was spotted perched on a hydro line near the ESSO gas station at Nanoose Bay. The Sunday Bird Walk went to Springwood Park Woods in Parksville. Among the highlights were the sighting of a RED-EYED VIREO. All eighteen birders heard and saw the Vireo. We saw the DOWNY WOODPECKER, HAIRY WOODPECKER, NORTHERN FLICKER, PILEATED WOODPECKER and RED-BREASTED SAPSUCKER. We also saw a nest with two PILEATED WOODPECKER fledglings peering out of their nest hole. WINTER WREN, BROWN CREEPER, SWAINSON'S THRUSH, AMERICAN ROBIN, CEDAR WAXWING, EUROPEAN STARLING, ORANGE-CROWNED WARBLER, YELLOW WARBLER, BLACK-THROATED GRAY WARBLER, WILSON'S WARBLER, MACGILLIVRAY'S WARBLER, WESTERN TANAGER, SPOTTED TOWHEE, CHIPPING SPARROW, SONG SPARROW, WHITE-CROWNED SPARROW, DARK-EYED JUNCO, BREWER'S BLACKBIRD, BLACK-HEADED GROSBEAK, BROWN-HEADED COWBIRD, PURPLE FINCH, HOUSE FINCH, PINE SISKIN and AMERICAN GOLDFINCH. A pair of BLACK SWIFTS were seen above Corfield Street in Parksville. Four PACIFIC LOONS and two RED-THROATED LOONS were seen off-shore from Oar Road in Lower Lantzville. A GREEN HERON was spotted at the small pond near the Forest Discovery Centre in Duncan. The Wednesday Bird Walk went to Legacy Marsh in Upper Lantzville. Among the highlights of the walk were many sighting of WESTERN TANAGERS as well as a number of WILLOW FLYCATCHERS singing from perches. A COOPER'S HAWK circled above us catching a thermal, rising up and out of sight. CHIPPING SPARROW, SONG SPARROW, WHITE-CROWNED SPARROW, BLACK-HEADED GROSBEAK, RED-WINGED BLACKBIRD, BROWN-HEADED COWBIRD, PURPLE FINCH, PINE SISKIN, AMERICAN GOLDFINCH. Two CASPIAN TERNS were spotted on the tide line off Sabastion Road in lower Lantzville. A CHURAK was seen on a side of the road along Shell Beach Road. Two PINE GROSBEAKS were seen visiting feeders in the 200 block of Starflower Way in Parksville. A BLACK-HEADED GROSBEAK with a strip on its head was seen along Lundgren Place in the Divers Lake area of Nanaimo. A BULLOCK'S ORIOLE was seen at Buttertubs Marsh in Nanaimo. A WHIMBREL was seen at the Hovercraft Base in Parksville Bay, Parksville. There will be no Wednesday Bird Walk on June 06, 2007. The Sunday Bird Walk on June 10, 2007 will be going to Neck Point Park. Met at the Bird Store at 9:00 a.m. or at the parking area at Neck Point Park at about 9:15 a.m.